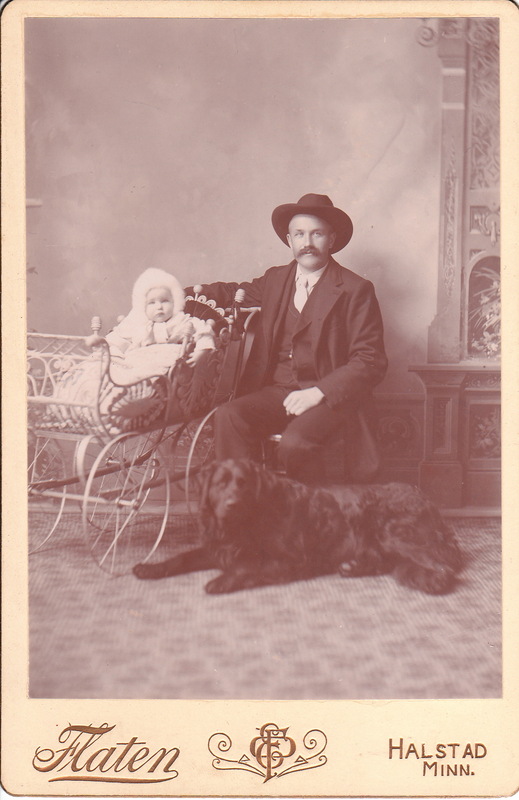 A man in western clothing, poses for his portrait along with his baby and dog. His arm is wrapped possessively around the back of the baby’s carriage. Lying in front of the man, is his loyal dog. The dog looks like a Labrador Retriever, but the previous owner of this cabinet card suggested that it resembles a New Foundland. This image is charming and warm. Where is this gentleman’s wife? Did she die in childbirth or by disease? Is she camera shy?. The answer, of course, is unknown. The photographer of this image is O. E. Flaten. Flaten’s studio was in Halstad, Minnesota. He produced a number of interesting photographic portraits of people living in the western United States. To view other photographs by Flaten, click on the category “Photographer: Flaten”.